„Worst of all: not to die in summer, when everything is bright and the earth is easy on the spade”. So wrote the German poet Gottfried Benn (1886 -1956), three years before his death, in the poem „What's bad”1. But if the wrong timing of one's death is the very worst thing, what is merely bad? To hear a good English crime story and not to master the language, was Benn's suggestion. Or to long for a beer in a heat wave and have no money. When he wrote these unusually light-hearted verses in 1953, Benn was at the height of his fame and having the time of his life. Seemingly uninhibited by any thoughts of his mortality and freed from his tedious practice in dermatology and venereology in Berlin, he was at last able to fully enjoy his life as an esteemed poet. 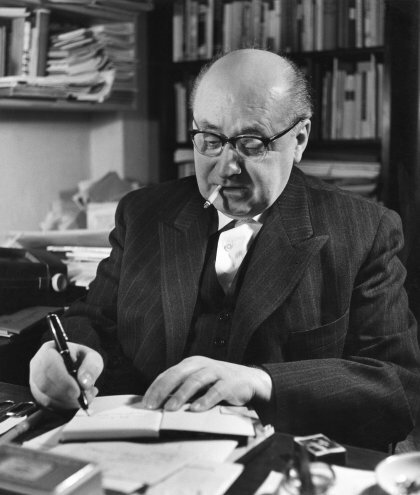 He received honors from academies and statesmen for his literary achievements, which were bestowed despite his shady past in the early years of the Nazi regime. Benn was on the short list for the Literature Nobel Prize and his work was frequently broadcast on the radio. Private life was just as enjoyable, enlivened by the companionship of young mistresses and made comfortable at home by his wife, the practicing dentist Ilse Benn. But death, and its grim forerunner named disease, had accompanied him ever since he gave up theology in favor of medicine at the military „Kaiser Wilhelm Akademie” in Berlin. Military medicine did not suit him, so he turned to pathology, dissecting hundreds of dead bodies. However, all he really wanted to be was a poet. A drowned beer-hauler was heaved onto the slab. into the brain lying alongside. Drink your fill in that vase! Lyrics about morgues were nothing new, even constituting a literary tradition followed by Rainer Maria Rilke (published in 1906), Georg Heym (1911), and other poets. But „Morgue and Other Poems” – a thin volume containing thirteen poems – broke with all traditions and rules, with aestheticism and decency. The collection was put together by the Berlin publisher Alfred Richard Meyer without consulting the author, much to Benn's dismay since he abhorred scandal. Dr. Benn's Morgue was breathtaking. It was outrageous, disgusting, and spectacular. And it catapulted the twenty-six year old poet, who had just begun to move within the inner circle of Berlin Bohème, to sudden fame and notoriety. The idyllic little aster surviving on blood, and the savaged body in one horrendous picture are difficult to bear, even for hardened readers of the 21st century. In 2011 there were massive protests against posters portraying the text of „Little Aster” displayed in Berlin's Public Transport network as part of an initiative to make poetry popular. The posters were withdrawn. Benn's verbal expressionism was by no means confined to the dead. Three poems in „Morgue” take the reader into the depths of a hospital seen through his cold naturalistic eyes. The poem „Man and Woman go through the Cancer Ward”4 virtually conveys the smells of the cancer ward in the Charité Hospital. Come, quietly lift up this coverlet. No one has so much blood. one rouses them a bit for visitors. are sore. You see the flies. And flesh is levelled down to earth. burns out. And sap prepares to flow. Apart from his lasting fascination with flowers, the author who wrote these shocking early poems can hardly be recognized as the one who, twenty-five years later, wrote transcendent melancholic rhymes about the same flower as a reminder of a golden dying summer („Astern”); or as the author of the 1950 work „Travelling”, which describes futile attempts to escape the inner „void”, always ending up with the „self defining inner self.” But no wonder! Benn had travelled through four decades with two world wars and a fascist regime, which although fascinating him at first, later drove him into inner exile and precarious life situations. He had experienced two marriages, several liaisons, and some friendships and animosities. And after all this, nothing was left, save for the void and the branded self, as he wrote in his 1953 poem„Two Things Only”. Benn's pain had become unbearable. He may have remembered the early and painful death of his mother from breast cancer. Back in Berlin with his wife Ilse, Benn sought hospital treatment. On the 6th of July 1956 the fatal diagnosis of cancer was established. The doctors gave him six months to live. He died the next day, on the 7th of July, a fine summer's day. Poetry Foundation https://www.poetryfoundation.org/ poetrymagazine/poems/detail/ 54403 (Accessed 31st of January 2017). Poetry Explorer http://www.poetryexplorer.net/ poem.php?id=10037929 (Accessed 31st of January 2017). Peter Voswinckel: Erinnerungsort Krebsbaracke, Deutsches Ärzteblatt, Jg.112, Heft 29-30, A 1284-1286. Florian Illies: Wir werden steigen, DER SPIEGEL, Nr.11, 2016: 122-126.